Hampton Blue Under 13s are pictured before their 1-0 PFA Cup win over Glinton & Northborough Black. From the they are, back, Mike Jarvis, Jamal Najfi, Aiden Brooks, Mikail Jessa, Louis Kashiri, Amaan Akbar, Jack Walton, Bradley McAvoy, Chris Atkinson, front, Jack Jackson, Owen Braithwaite, Sam Turner, Daniel Groom-Smith, Joe Jarvis, Ben Atkinson and Nathan Bellamy. It was a good weekend for Peterborough Junior Alliance League sides involved in the Under 12 Northants Cup on Sunday. Three of the four sides in action made their way through to the third round of the competition. Glinton & Northborough Black Under 13s are pictured before a 1-0 PFA Cup defeat by Hampton Blue. From the left are, back, Joe Atkins, Matt Row, Josh Marshall, Oliver Priestley, Kev Hughes (coach), Ben Brittain, Joseph Hughes , Daniel Martin, Frank Martin (coach), front, Stephen Bull (manager), Vinnie Ball, Ollie Wooley, Dylan Phillips, Kyle Bull, Jose Mason-Baxter, Gytis Palacionis and Jude Hinch . 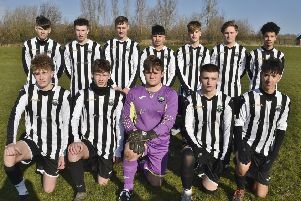 Division Three teams FC Peterborough and Oundle Town were both big winners - 6-0 and 6-1 against West Haddon Albion and Stewart & Lloyds respectively - while Feeder Soccer from Division One won 3-2 at Irchester Romans. Gunthorpe Harriers Sky were the one Junior Alliance team to miss out and they were only just pipped 5-4 in a penalty shoot-out after a 2-2 draw with Northampton Inspiration. Junior Alliance League sides were less successful in the Under 14 Northants Cup. Five were involved but only Peterborough Northern Star White and Werrington Athletic progressed. Star beat Northampton Thorplands 3-1 with goals by Luca Phillips (2) and Oliver Lord while Werrington won 2-0 at Moulton Magpies thanks to two goals from substitute Leon Kavanagh . Action fron the Hampton Blue Under 13s v Glinton & Northborough Black game. In the Under 14 Hunts Cup, Yaxley Blue walloped Warboys Colts 16-0 with Kyall Woods claiming five goals and sub Joshua Hogg hitting a hat-trick.